What is commonly known in the West as Frankincense is the resin exude from certain trees of the genus Boswellia in the Burseraceae family. Most sources on the subject use the terms Olibanum and Frankincense as synonyms, but a few try to make the point that Olibanum actually refers to a different species of resin than Frankincense. To further complicate matters the term Olibanum in many Near Eastern regions and in Africa is often a word that signifies "incense" in a very generic sense (which is very similar to the use of the word "Copal" in Central and South America). Often other resins such as Pine Resin, Gum Mastic, and White Damar are passed off as Olibanum, either intentionally or through ignorance of western names. A similar phenomenon happens with the word "Benjamin" which usually indicates Benzoin Sumatra, but which in some localities is actually a term for a type of African Frankincense (usually Boswellia Carterri from Kenya and similar locales). Some biblical scholars try to separate Frankincense from Olibanum when researching incenses of the Bible, and this is what causes many incense users confusion. The best of the research on this theme seems to indicate that the Olibanum of the Old Testament is in fact Boswellia Serrata, a close relative of Frankincense which mainly comes from a tree best known in India, but which also grows elsewhere. From our experiences with resins from around the world, this seems to make sense as the aroma of the various B. Serrata resins are distinct from the other species of Frankincense trees. This aroma difference would have been important to the Ancients. We follow this tradition, and therefore name all of the B. Serrata species "Olibanum", and the rest "Frankincense". Olibanum has a distinct Orange citrus aroma, both dark and heavy as in the African variety or light and clear as in best of the Indian variety. 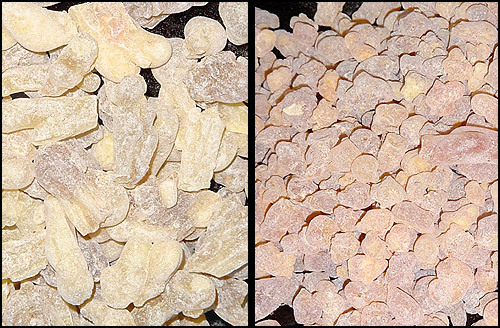 Most Frankincense resins, starting with the best B. Sacra of Oman, and running down through B. Carterii of Africa, have a distinct lemon or sometimes lemon-lime aroma. There is a definite difference in aroma and color between Boswellia Serrata and the other Boswellia species as well, with the Olibanum tending towards orange and the Frankincense having more yellow to green colors.